STUDENTS OF KISMET-FAIRE POLYHEDRAL ACADEMY! Are your grades an embarrassment? Have you neglected your community service obligations? Will universities be underwhelmed by your extracurricular portfolio? Is your life utterly devoid of spontaneity and stimulation? MARVELOUS! This most preparatory program will help you find the side of yourself you never knew you had!! 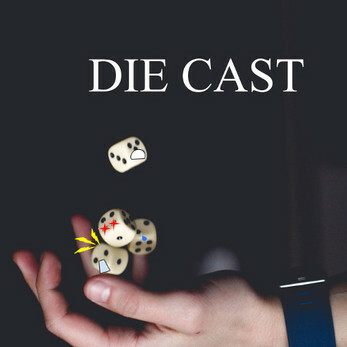 Die Cast is a game about dice. It is a game involving dice. It is a game where you do not roll dice! Instead, you will be role-playing as dice! You've just joined a club that promises to improve every facet of your academic life! All you're asked to do is participate in the timeless tradition of randomized-storytelling! That...and face the hard truth that you will NEVER understand what does or doesn't make your Audience happy!